In his real life, Cliff Snider assists hundreds of artists in the production and marketing of their talents. But there is more than meets the eye. This husband, father, and grandfather has spent over forty-five years making spirits bright as Santa Claus. For Cliff this is a doubly important mission, for though he holds it important to bring smiles to children of all ages he also makes his true mission bringing the love of Christ to all he meets. Known internationally as the “Praying Santa”, Cliff Snider has been seen in countless articles and news interviews about his portrayal of a truly Christian Santa Claus. These include CBN television’s 700 Club and in Our State magazine (North Carolina publication). 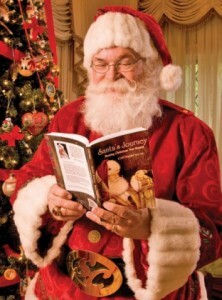 He has authored the book “Santa’s Journey” which tells all about his life, adventures, and faith. A 2012 winner of the “Keep Christ in Christmas” award, Cliff is one of the most recognized Santa portrayers in America with his image being used by many notable artists.